One of Cairns’ primary tourist attractions. World famous Green Island is a tropical cay just 45 minutes from Cairns. Situated in the Great Barrier Reef and surrounded by white sandy beaches and sapphire blue waters, Green Island is perfect for that ultimate island getaway. 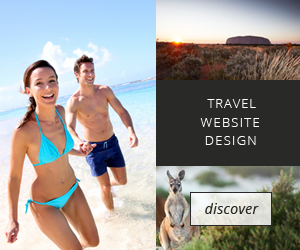 For nearly fifty years Green Island has been one of Cairns’ primary tourist attractions. A small, coral cay it once had nothing more than a jetty, a marine viewing point at the end of the jetty and a few huts. Green Island is a small (15-hectare) coral cay which can be effortlessly walked around in 20 minutes, making it a popular destination for day trippers from Cairns. In fact its circumference is almost exactly 1.5 kilometres. It is about 300 metres wide and 650 metres long. The edges of the island are either compacted coral or rather beautiful coral/sand beaches. The interior is predominantly rainforest. The resort takes up only 12 per cent of the total island so, remarkably, there are still plenty of places where people can escape. Green Island is home to 126 native plant species, a myriad of birdlife and surrounded by magnificent coral gardens. The following video shows the short trip to Green Island (please excuse the wind noise). Operating out of Cairns, Big Cat Green Island Reef Cruises takes you to a part of a protected Marine Park, Green Island – a beautiful coral cay readily identified from the air by its emerald rainforest surrounded by white sandy beaches and beautiful coral reefs. Enjoy a Green Island Cruise with Big Cat Green Island Reef Cruises whilst discovering the fascinating underwater world among the coral reefs surrounding Green Island. Big Cat Green Island Cruises will supply you with an endless variety of colourful fish, turtles, giant clams, starfish, shells, anemones, eels, sponges, sea urchins and many more incredible marine creatures. For those that love the water, Big Cat Green Island Cruises also make for the perfect time to snorkel, scuba dive, swim, view the coral and fish life from the comfort of a glass bottom boat or semi-submersible or just relax on the sandy beaches. There has been some sort of holiday accommodation on Green Island since a guesthouse was established there in the late 1930s. Still it has always remained primarily a daytripper destination. Resort facilities include luxury accommodation, a licensed bar, indoor/outdoor dining, boutiques, dive and snorkel shops, beach hire and a 25m swimming pool. Green Island Resort is widely regarded as one of the world’s most eco-sensitive tourism developments. Structurally, all resort buildings and infrastructure (e.g. boardwalks) were built with minimal vegetation clearing, in many cases the structures were built around the trees. No building extrudes above the tree canopy, therefore preserving the natural appearance of the island from the water, shoreline and air. Explore Green Island’s rainforest and reef environment, unlike any other. Welcome to paradise. Snorkelers exploring the coral reef at Green island. Green Island Resort’s Club Spa Massage and Beauty facility offers rejuvenating and indulging treatments that restore harmony to the mind, body and soul. 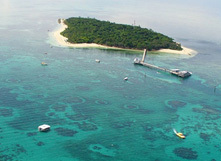 Big Cat Green Island Reef Cruises operates full day and half day cruises to famous Green Island.